Bethel, CT (PRWEB) November 6, 2008 -- When an emergency strikes, nothing is more welcoming than a calm voice and a reliable power supply. Duracell® is providing a bit of both with the introduction of Duracell® Powerpack 450 with Voice. It's a solution that consumers need, according to a recent survey¹ that shows the majority of Americans are not equipped for power emergencies either at home or on the road. Duracell® Powerpack 450 with Voice is a durable, stand-alone power supply with 450 watts of AC household power for important electronics and appliances. Its voice technology - new to the portable power category - "talks" consumers through how to use the Powerpacks' built-in vehicle jump-start system. The voice technology also tells consumers how to inflate a tire with the Powerpack's built-in air compressor, and it tells them how much runtime they have for each device connected to the Powerpack's multiple outlets. "The Duracell Powerpack 450 with Voice is designed to be rugged to stand up to road trips, picnics and camping," said Rick June, Duracell vice president and general manager. "It also provides the reassurance of a night light and a comforting voice. When you are away from home, it's great to know you have a power backup that can also help perform the most obvious and crucial road fixes." 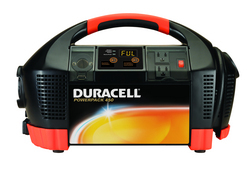 Americans who travel are no more prepared with power on the road: 71% do not have an emergency preparedness kit in their vehicle, and only 11% have an independent jump-start solution that does not require another vehicle's assistance.¹ Duracell® Powerpack 450 with Voice helps Americans have peace of mind at home and while travelling. These power solutions are available online and at select mass and specialty retail stores nationwide. Visit www.duracellpower.com to learn about the full line of products. These new products are being introduced through Duracell's business alliance with Xantrex Technology Inc., which began in June 2007. Xantrex is an innovator in portable power and backup power products. Xantrex solutions allow consumers to operate and charge mobile electronic devices such as laptop computers, PDAs, cell phones and more, so they can stay productive when on the go. Xantrex also provides portable and home emergency backup power sources, and smart charging capabilities for automotive batteries. Part of the Procter & Gamble Company (NYSE:PG), Duracell has been powering people around the world for more than 40 years. Our products serve as the heart of devices that keep people connected, protect their families, entertain them and simplify their increasingly mobile lifestyles. As the world's leading manufacturer of high-performance alkaline batteries, Duracell also innovates in disposable, renewable and peripheral technologies and markets general purpose flashlights along with the advanced Daylite® LED flashlights. Visit www.duracell.com for more information. Three billion times a day, P&G brands touch the lives of people around the world. The company has one of the strongest portfolios of trusted, quality, leadership brands, including Pampers®, Tide®, Ariel®, Always®, Whisper®, Pantene®, Mach3®, Bounty®, Dawn®, Gain®, Pringles®, Folgers®, Charmin®, Downy®, Lenor®, Iams®, Crest®, Oral-B®, Actonel®, Duracell®, Olay®, Head & Shoulders®, Wella®, Gillette®, and Braun®. The P&G community consists of 138,000 employees working in over 80 countries worldwide. Please visit www.pg.com for the latest news and in-depth information about P&G and its brands.